January is a wonderful month to visit Walt Disney World Resort. My family has always enjoyed our January trips. It's cooler and If you time it right you can enjoy some of the lowest crowd levels of the year. Marathon Weekend and Martin Luther King Jr. Weekend are the busiest and even those are nothing like the crowds of Christmas. January is also the month for rehabs and closures. The rehabs and closures listed below are from Disney's official rehab calendar and unofficial sources and are subject to change without notice. If you would like more information please call, Voice: (407) 824-4321 TTY: (407) 827-5141 prior to your arrival. Casey's Corner closed January 6 - February 15, 2014. Tomorrowland Speedway closed January 6 - 12, 2014. Splash Mountain closed January 6 - March 21, 2014. Splashdown Photos closed January 6 - March 21, 2014. Agrabah Bazaar closed January 7 -February 13, 2014. The Magic Carpets of Aladdin closed January 13 - 16, 2014. Liberty Square Riverboat closed January 21 - 30, 2014. Celebrate a Dream Come True Parade: The last performance is January 5, 2014. American Adventure Restrooms closed mid-January - End of January. Monsters, Inc. Meet & Greet closed January 5 - 19, 2014. Festival of the Lion King closes January 6, 2014. Camp Minnie-Mickey closes January 6, 2014. 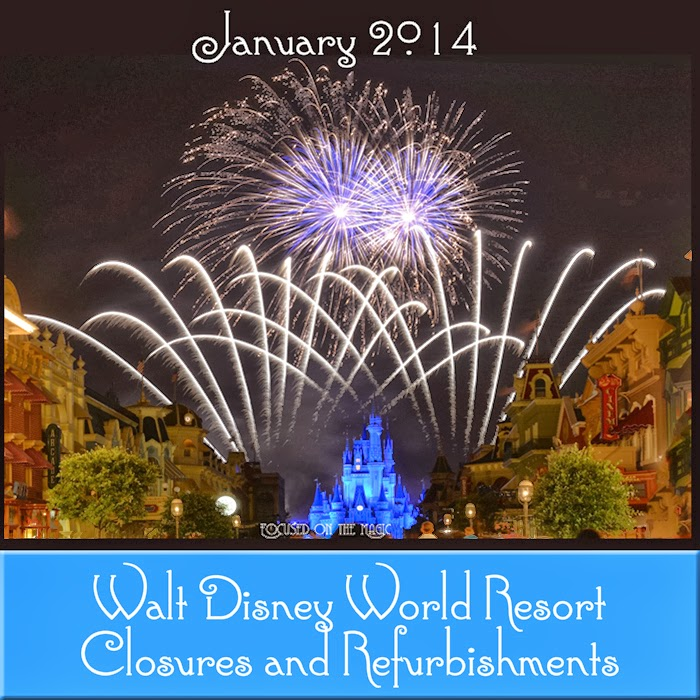 Closed for refurbishment January 6 - March 17, 2014. Disney's Typhoon Lagoon Water Park will be open at this time, weather permitting. Downtown Disney Athletic Club (shop) closed January 27 - June 13, 2014. Disney's Animal Kingdom Villas - Kiddie Pool Wet Deck closed January 21 - February 14, 2014. The pool itself will remain open. Disney's Caribbean Beach Resort - Pool Slides closed January 27 - February 7, 2014. The pools themselves are open. Disney's Contemporary Resort- Bay Lake Tower Kiddie Pool Wet Deck closed January 13 - February 7, 2014. The pool itself will remain open. Disney's Grand Floridian Resort - Victoria & Albert's Restaurant closed January 19 - 28, 2014. Disney's Old Key West Resort - Goods to Go closed January 20 - 30, 2014. Disney's Polynesian Resort - Sunset Beach and access to the eastern part of the beach, near the Transportation and Ticket Center, will be unavailable due to construction. Disney's Port Orleans Resort - French Quarter / Doubloon Lagoon Pool will be closed January 13 - February 28, 2014. Guests may use the pools at Disney's Port Orleans Riverside Resort. Disney's Port Orleans Resort - Riverside / Magnolia Bend Pool Deck will be closed January 20 - 21, 2014. Disney's Saratoga Springs Resort - Congress Park Pool closed January 22 - 23, 2014. Disney's Yacht Club Resort - Quiet Pool closed January 21 - February 7, 2014.